Hey peoples! I know my post is overdue (blame Nibi!) but better late than never, non? 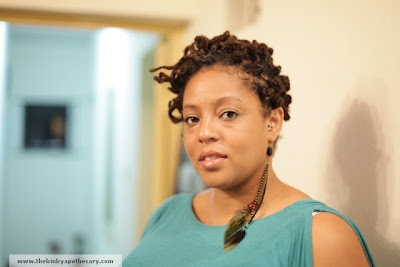 Maintenance is an important part of having healthy locs and part of loc maintenance is the regular re-twisting of your new growth, which ensures that the hair continues to loc. The palm rolling versus interlocking debate can be a heated one and varies wildly depending on whom you speak to. I have spoken with locticians that favour one and disparage the other and some that use both techniques. The main issue, as I see it, is lack of proper “how-to” knowledge, either on your part or your loctician’s, leading to damaged locs. Don’t be fooled into thinking that everyone that dons the title “Loctician” knows what he or she is doing. 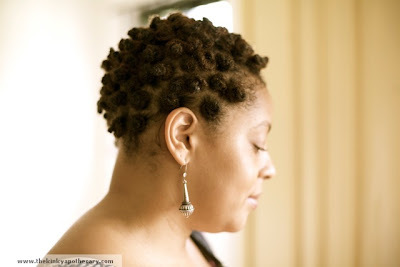 So what is the proper way to re-twist new growth? I think this boils down to personal preference; both techniques have their pros and cons. Palm rolling will give you a lovely cylindrical look, while interlocking produces a ropeier but tighter loc – no unraveling. 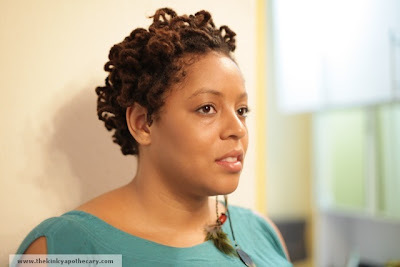 I started my first set of locs with palm rolling and eventually switched to interlocking (myself), as I had a lot of slippage with the locs in the middle of my head. This time round I do both, interlocking every 2 to 3 months and palm rolling as needed. The procedure for palm rolling is exactly as it sounds: rolling the loc in your palm, with the aid of a light gel, loc butter or even plain old water. The key is to always, ALWAYS roll your locs in the same direction in order to train your roots and to avoid warping the rest of the loc. Interlocking can be done with your fingers, a latchhook or crotchet needle, using a 4 point or 3 point method i.e. passing the tip of the loc through the root (as if it were a clock face). Enter the loc at 3 to 9, 12 to 6, 9 to 3, 6 to 12. (3 point: enter from 9 to 3, 12 to 6, 3 to 9). The point is to NEVER pass the tool in the same direction, as this will leave a "Y" part at the roots that you definitely do not want. Essentially, you will have split the root into two. I made this mistake once; with my first set of locs and boooooy was it a complete [insert expletive] to undo. After creating the Y, in an effort to back track, I ended up making a knot at the root of my loc. I did eventually unravel it, after much cursing and a temper tantrum that would have made any toddler proud! With either technique you need to be gentle with your locs. 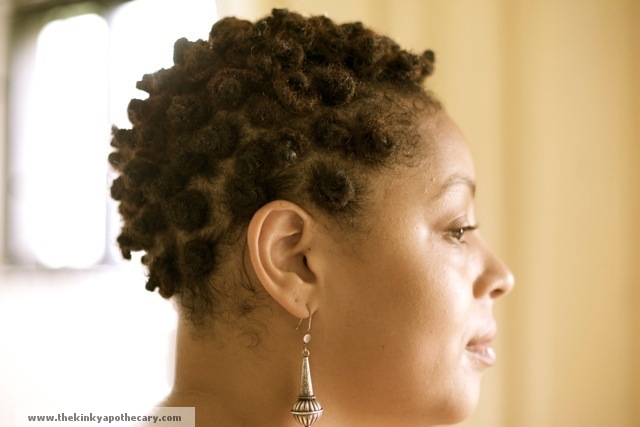 Don’t over twist with palm rolling or interlock too tight, as this will lead to a painful scalp or worse, weak and or broken locs. Due to a bout of extreme laziness, (don’t judge me, it happens), I decided to try a clip free method of palm rolling. 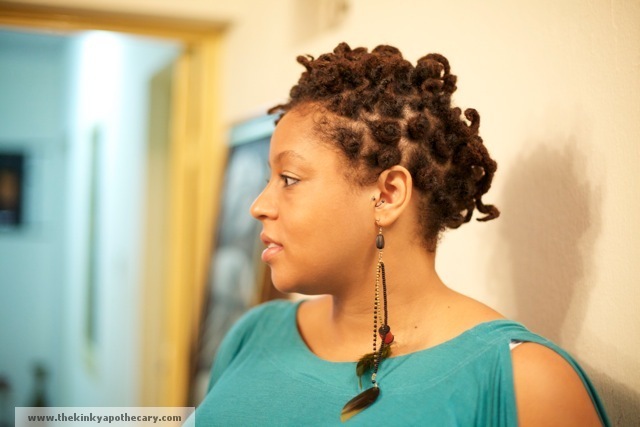 After washing my locs, I sectioned into four bunches and then palm rolled each loc before twisting into a Bantu knot. 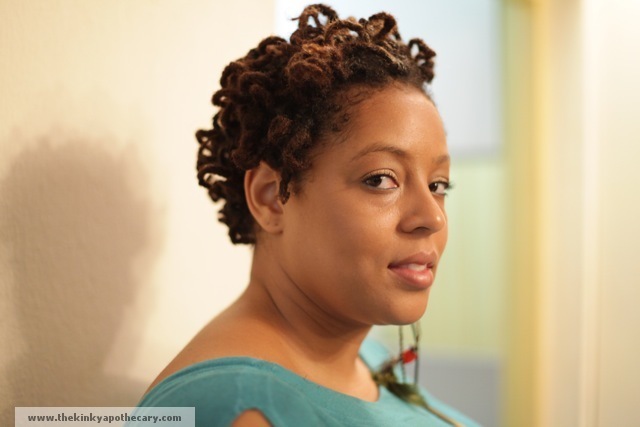 I wore the Bantu knots for two days and then pulled them out into a new curly do. I admit that despite my initial apprehension of too much forehead with the Bantu knots and medusa curls on the pull out, I quite liked the end result with both stlyes. I did bantu knots once and it was so painful. I've not done it since. I used to have braidlocks and I interlocked at a 3 point rotation. I skipped 12 o' clock and just did 3, 6, 9. I have traditional locs now and I really tempted to go back to braidlocks. From my past experience, interlocking is great, super easy for me since I've been combing/styling/doing my own hair since I was 7. I am very comfortable with working in my own head and I'm willing to take on any mistakes. Anyway, I've just recently discovered that 4 point rotations gives the loc a different look than a 3 point and I was doing some research on what that looked like upclose. Note* anyone wanting a fuller or thicker loc overall should opt for palm rolling. Interlocking make the loc more compact (not thin as in weak) but just smaller in size. I wanted to clear that up because everyone's locs get more compact as they mature but their is a difference in density when it comes to palm roll and interlocking. I'm a self diagnosed serial locker - I've been loc'd on and off for 9 years. I've has different sizes and different maintenance routines...I've had a ton of experience. Yes you can I have done. However the smaller your locs the more difficult it is.